Up next tonight, (12:05 RTE 2) is ‘The Apparel’ written by Dan Mooney and directed by Peter Delaney under the guidance of Gerry Stembridge. We are in the final stages of the Offline cut of the Film Limerick Trilogy. The short films, The Apparel, Day Off and Date:Time are now being spotted by the music composers and the final preparations for the delivery to the online and sound mixing team will take place in the coming weeks. In what has been an ambitious project, realised by Film Limerick Project manager, Ronan Cassidy, and Irish writer and Director Gerry Stembridge, the trilogy of films has brought together both professional and aspiring film makers in Limerick to create a film cultural legacy that will hopefully continue for many years to come. As editor on the three films, I have had the opportunity not only to work with three new directors and experience their vision for the stories but I have also had the opportunity to train in three assistant editors and give them a practical and first person view of the craft of editing, here at the facilities of Limerick Institute of Technology. Maeve Humphreys, Patryk Czekalski and Mark Griffin have all worked on scenes for the films as well as give their interpretation and input to the ideas of the films. 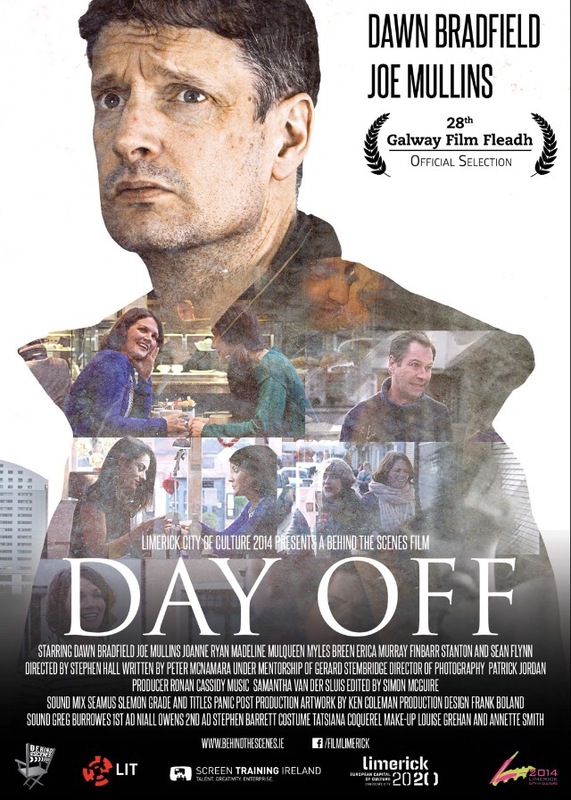 Similar training opportunities were given on set by Gerry, Ronan and the DOP Paddy Jordan to the different production departments, giving this project its unique selling point for future investment. In some cases the trainees have had other opportunities to work on professional productions around the country which in turn cements the early success of the Film Limerick Trilogy before its even been completed. As the online post production, grading and sound mixing are nearing, there is a sense of anticipation for the premiere screening of these films by the cast and crew. Also with the impending new academic year in the third level institutions such as Limerick Institute of Technology and Limerick College of Further Education, it is hoped that current and incoming students take advantage of the possible future opportunities that may arise from the back of this project. Details of the premiere of the trilogy will be made on the Behind the Scenes website HERE. The production on the final film, Date:Time, of the Film Limerick Training Trilogy has finished. With a tired cast and crew it is now down to the Post Production team to work their magic and deliver the trilogy in the coming months. A big thank you to everyone who was involved and a big shout out to the film making talent of Limerick in getting behind this ambitious project. Keep an eye of the Behind The Scenes Website (Click HERE) for details of the premiere in the Autumn as well as further updates on all of the Limerick City of Culture / Film Limerick funded films. With a full house in attendance of film makers, the media and the crews of the Film Limerick Trilogy films, short excerpts of the first two films that are nearing completion were screened along with a panel discussion. Writer, Daniel Mooney (The Apparel), Director, Peter Delaney (The Apparel) and Director, Stephen Hall (Day Off) gave a in-depth insight to their experience of working on the unique Film Limerick project answering questions from Film Limerick Project Manager Ronan Cassidy and members of the audience. Audience at the Film Limerick Scene Screening. With the third film ‘Date:Time’ to go into production on July 22nd, this event has generated a positive vibe with the cast and crew, giving them a clear idea of how the films are progressing and the advantages of working on the Film Limerick project. Also mentioned were the two Bursary films, Lost and Found and The Clockmakers Dream. Both of which received €15,000 each through the Limerick City of Culture 2014, Film Limerick and Behind The Scenes, and are in the final stages of post production. The teaser trailer for Lost and Found was screened also which stars many local and familiar Limerick Acting talent. This trailer can be viewed below. Behind the Scenes would like to again thank all who worked, volunteered or simply supported the trilogy project and look forward to the completion of the final film and the premiere of all three at a date in September 2015. The Behind The Scenes Team. A big thank you to everyone who has worked on, and supported the Film Limerick Trilogy Short Films [Day Off – Director Steve Hall, Writer Peter McNamara and The Apparel – Director Peter Delaney, Writer Dan Mooney]. We look forward to seeing you all again, and collaborating with you on future film projects. ***Why not come down to Dolans on Monday 29th June at 7:00pm to see Exclusive Scenes from the short films, with a Director and Panel Talk on the night***. We will also be discussing on the night the final film of The Limerick Trilogy, “Date:Time” (Writer – Philip Shanahan, Director Paul Corey) which is scheduled to go into production mid July. Am delighted to be working on this project and there is certainly a buzz around the film community in Limerick. Here’s hoping it will help with the Limerick2020 bid in the coming months. For our rescheduled event from February we will be having a meeting at Dolan’s, Dock Road, Limerick. 1.Behind the Scenes update on Annual General Meeting [AGM]. 2.Film Limerick update: including Trilogy, Lost and Found, the Clock Makers Doll. 4.Film Festivals Dates and Deadlines. Where: Dolans, Dock Road, Limerick.